SedonaEye.com financial columnist J. Rick Normand notes in his latest National Monument designation expose’ that the RESCUE OUR ARIZONA RED ROCKS (ROARR) Movement Gains Momentum as KSB Falters! 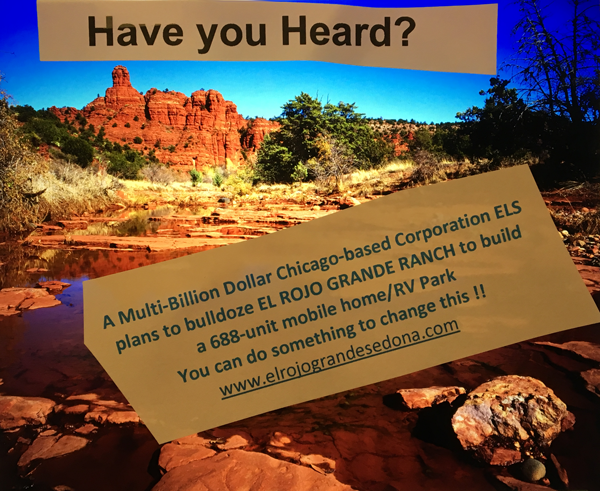 Sedona AZ (September 14, 2015) – Sorry to interrupt your regularly scheduled program, but the ROARR movement is gaining inmmense momentum against KSB, the Sierra Club and the City of Sedona activist Councilors! For several months now, ever so slowly, small groups around the Verde Valley and its environs have been forming, independently, to explore the Keep Sedona Beautiful and Sierra Club’s marketing efforts relative to the proposed Sedona-Verde Valley Red Rock National Monument designation. As they have begun to discover that there are immense and likely permanent downside risks to such a federal land resource designation, that deliberately have not been disclosed to an unwary public by its proponents, opposition has organized and coalesced into a movement. One of the problems for this growing movement against KSB’s push for the SVVRRNM designation is that it doesn’t have a name, or handle, that is identifiable in the media that isn’t extremely wordy and cumbersome to refer to. The proponents are known as KSB, the anti-proponents as “the conspiracy theorists against the SVVRRNM.” I think its time for the anti-designation proponents to find a memorable name, or handle, that instantly identifies who we are to the rest of the country, our Congressional delegation, and the statewide, if not national, news media. Thus, I am proposing that our movement adopt the title of “Rescue Our Arizona Red Rocks” or “ROARR!” which is what we’re beginning to do! I have intentionally left the name “Sedona” out of this proposed handle because the NM designation proposal involves the whole Verde Valley and northern Arizona, not just the City of Sedona which is fast developing a reputation for its arrogance by acting as if it speaks for all 80,000 residents of the Verde Valley without having the common decency to ask for their input. While KSB and the Sierra Club were both started by well-meaning environmental activists with the highest of goal standards, both have now been taken over by a political movement with an agenda that has departed from their original mission statements. Am I audacious for making this claim? Many will say so, but hear me out. I will prove what I allege if you’ll read on. Why are certain City Councilors, and by proxy, the City Government, involved with this issue at all since it’s a political issue that affects all the Verde Valley and must be requested of another political layer for presentation to the federal government, namely our Congressional delegation, who’s majority does not favor the NM designation? 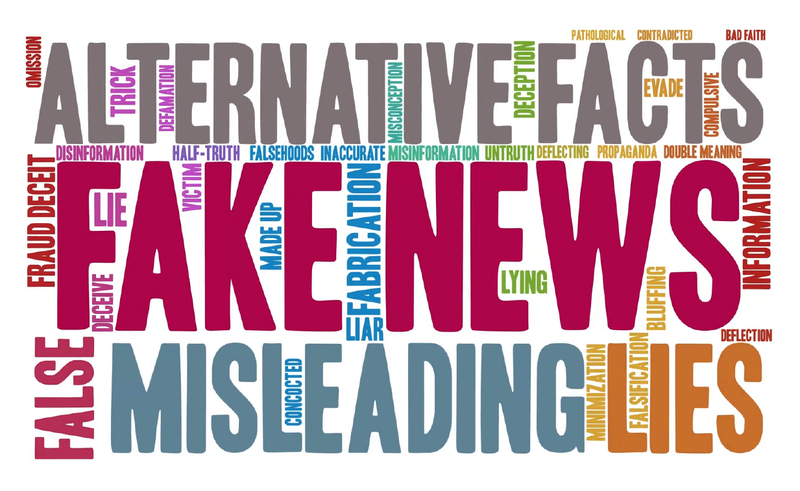 Why does the published marketing in favor of the NM designation list nefarious studies and supporting organizations supported by no demonstable facts, but rather only by unsubstantiated emotional arguments? Why did Sedona’s Mayor publicly admit that the “Monument Workgroup” is KSB, whose members had never been identified in print, yet who were called to action by the City to prepare a report on the purported need for the NM designation? Why do the Monument Workgroup and the proponents of the NM designation fail to mention a single downside probability to the NM designation when there are dozens of legitimate and probable legal, operational, economic and quality-of-life issues that are not ever mentioned? Not a single one, mind you! Why can’t KSB, the Sierra Club, the Monument Workgroup, and the City of Sedona get a single federal land and resource management official in Washington, D.C. to come to the Verde Valley and admit, in a public forum, that all of the proponent’s purported fact allegations are true? For instance, the proponent’s marketing says that the National Forest Service rather than the National Park Service will manage the NM while they can’t produce a written guarantee from any federal land and resource managment agency as to that alleged fact. And, that is a huge, if not, cataclysmic distinction explained below…and KSB and the Sierra Club know it! 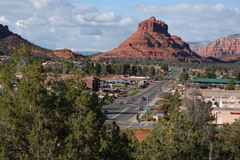 Since it is alleged that a National Monument designation results in extraordinary economic benefits due to an increase in tourism, how is the Verde Valley, and particularly Sedona, going to handle all that increased traffic flow seven days a week when we are currently being strangled by overwhelming unmanageable traffic just three days a week? And, by the way, how many of you have noticed the traffic jams now beginning to occur in west Sedona southbound on 89A to Cottonwood? What is happening? Motorists experienced with the traffic jam ups on SR 179 on their way to I-17, in order to get home in the Verde Valley, have decided it’s faster to go through west Sedona to get to the SR 260 through Cottonwood to I-17. Just wait until you see what happens if the NM designation is passed. That prospect is not just a matted of traffic jams on steroids but horrendous air pollution that we’ve never known before. Finally, why is it that every published writer in the area who writes supporting the ROARR movement and employs the support of empirical evidence, points of authority, expert opinions, legal opinions, economic opinions and logical arguments are immediately attacked by commenters and bloggers who never recite any such counter-evidence but always fall back on personal attacks upon the writers? In appearance, it is worded to appear official and unchallengeable, as well as reliable, when in newspaper print. That is, at least to the unwary eye who still believes KSB and the Sierra Club to be altruistic organizations. The top-of-page and across-the-page headline reads “Preliminary Management Recommendations for the Proposed Sedona Verde Valley Red Rock National Monument.” Recommendations from whom, explicitly, and to whom, explicitly? The advertisement never makes that clear. If it meets the definition of “official” then there should be no question about who makes the claim and paid for the advertisement. Sounds great, but the fact of the matter is that National Monuments nationwide are suffering from an unfunded $11.5 billion dollar budget shortfall which has existed for most of the Obama Administration and there has been terrible degradation of most all of Arizona’s 22 National Monuments throughout the state. Note that not a single one of them is managed by the U.S. Forest Service which is claimed by the (nefarious) Monument Workgroup to be the federal management agency that will manage the proposed SVVRRNM – even though KSB, the Sierra Club, Tom O’Halleran, and AZ Congressperson Ann Kirkpatrick can’t come up with a written federal guarantee. In fact, all of our state’s National Monuments are managed by either the National Park Service or the BLM. Nevertheless, is there any consequence to a distinction between management of the subject proposed National Monument by the U.S. Forest Service or the National Park Service? Yes, there is a monumental (pun intended) consequence that the Red Rock News advertisement conveniently doesn’t mention. 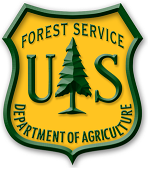 The U.S. Forest Service is a sub-agency of the U.S. Department of Agriculture which operates under lenient rules towards public access and activities inside the federal land management designation, whereas the National Park Service, that operates under Draconian rules towards public access and activities in the designated territory, is a sub-agency of the Department of the Interior. And, so is the Bureau of Land Management, architect of of state’s rights publicity disaster in Bunkerville, Nevada and the EPA, architect of the ecological disasters in Durango, Colorado and in eastern Arizona in 2002 relative to the nation’s worst ever forest fire known as the Rodeo-Chediski fire. Meanwhile, our National Monuments, nationwide, as mentioned earlier, currently suffer an $11.5 billion backlog of deferred maintenance of aging infrastructure facilities which has existed since the end of the Bush II administration – and will take many years just to catch up once funding is approved which isn’t even under consideration for Congressional action at this time. Continuing with the KSB – Sierra Club full page advertisement content, there is a box with the caption at the top that says, “The following recommendations are essential to protect the values of the Monument and they must be consistent with the proper care and management of the objects to be protected by the Proclamation.” Within the box, there are 31 seemingly official recommendations. What they constitute, though, is a wish list, without any federal guarantee document proposed, to ensure that anything on the wish list is ever accomplished! What’s worse is that the most significant of the recommendations are predicated upon management of the subject proposed National Monument by the lenient U.S. Forest Service as opposed to the Draconian National Park Service, with no written federal land and resource management agency guarantee that the USFS will be the intial management agency nor will it not be subject to replacement due to the will of whichever Presidential Administration is in power. This is said in light of the fact that there are currently in the United States 117 National Monuments and all but 9 have had their management assigned to the National Park Service. This Monument Workgroup slight-of-hand is meant to deceive the unwitting public supporters of the SVVRRNM designation proposal into believing that the proposed management will be beneficent. What this rancorous debate all comes down to is this…if KSB, the Sierra Club, the Monument Workgroup, the Mayor, City Councilors and other former City public officials who are proponents of the proposed NM designation were really intent upon acting in the best interests of the City and the Verde Valley, they would evidence sufficient integrity to couch their published arguments in a foundation based upon presentation of both sides arguments, presentation of demonstrable facts, fair and equal consideration for the vast unincorporated areas of the Verde Valley, its other municipalities, and its other townships not within the Sedona City Limits, and, most importantly of all, to objectively inform the unwitting NM proponents who trust them without question of all known facts and potential repercussions! But, instead, what the public has gotten from the aforementioned trusted people in power is a tactical shell game of “keep ‘em lookin’ eslewhere (see Mark Dice videos @https://www.youtube.com/user/markdice to see how this tactic works).” KSB, the Sierra Club, Tom O’Halleran, Congressperson Ann Kirkpatrick, and the NM proponents don’t deal with facts, nor even quantifiable probabilities, but, rather, in speculations based on their own personal belief systems. Not to mention intimidation of opposition writers by threats of libel lawsuits and complaints to the police of harassment and physical threats that never happened, published anonymous studies by anonymous workgroups who propose fallacious recommendations based on nonexistent or misstated facts couched in hidden agendas, guilt trips, and political overreach styled as speculative “consequences of inaction” (want to stop ATVs..then have ADOT ban them from state roads of access to the more sensitive Red Rock areas..), threat of political coercion such as Presidential Executive Orders, and, arrogance at public events with no mention of downside risks (they’d have you believe there are none)! The needs of a busy city are incongruent with the restrictions of a National Monument: Studies of the economic impact of National Monuments on a given area have stated that “land locking by a national monument may not be legal.” No one is sure as it has never been done. Sedona and the Verde Valley may be the unfortunate guinea pigs. Real issues are water, sewer, power, roads, insecticides, herbicides, firefighting – all of which may become points of contention that may require EIS and NEPA studies costing millions of dollars payable by local Monument adjacent areas, not by the federal government. If so, we will be forced to pay for those studies, even if relative to adjacent private land. It would be rare that any new utilities or roads would ever be allowed in a National Monument, and infrastructure repairs may require NEPA studies. As I have mentioned in my recent article @ http://sedonaeye.com/damn-all-of-you-who-want-all-the-facts/” the Property Clause of the U.S. Constitution states that “Congress shall have power to dispose of and make all needful Rules and Regulations respecting the Territory or other property belonging to the United States …” (Article IV, Section 3, Clause 2).” When deciding whether it is appropriate for federal agencies to regulate private, county and state property, to protect federal lands from external threats, the federal courts have consistently ruled in favor of the “inholders rule” which gives the federal government the right and power to assert its political and physical control over adjacent non-federal property (including municipalities,) in order to eliminate any threats to the objectives of the federal land management policy within the federal stewardship land. Call it what you want…I call it martial law! If the “inholding rule” can be applied to the extra territorial areas just mentioned, the fact of local self-governance could be impaired and we could find the place we live and love under indirect, or even direct, federal authority. At the minimum, if the inholding rule does apply in our case, if the subject National Monument designation is accomplished, this could give the Feds a choke-hold on our local economy, qualify-of-life issues, and our liberty. What the SVVRRNM will give the Verde Valley and the cities of Sedona, Camp Verde, Cottonwood, Jerome and Clarkdale as well as the VOC, Cornville and Page Springs is a new layer of political control over private property. We’ll have unincorporated areas of the Verde Valley and its city municipalities overlayed with the Local Land Use Program Administration, and the Jurisdictional Inquiry Unit, which provides advice to landowners and potential project sponsors regarding Agency jurisdiction, including informal phone advice and written jurisdictional determinations. Bureau staff will help citizens determine if an Agency permit or variance is required. Determinations often require a full deed history and other legal and factual research. The Jurisdictional Inquiry Staff also handles referrals from other agencies, telephone calls, and walk-in members of the public. 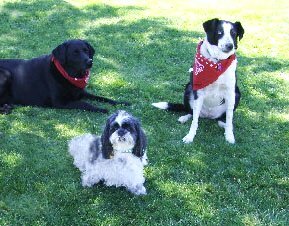 Harley McGuire and pals love hiking and walking Sedona red rock trails! Contact your local representative for more information on access restrictions to National Monuments by pets. With National Monument status, we’ll have a whole new layer of political control as if we don’t have enough already. There will be even more restrictions on public land usage that we currently enjoy. Each of you now have a right to enjoy our public land, but the Feds believe that being inside a National Monument is a privilege, not a right! Each of us could see a loss of mountain biking trails (99% of our trails were made by bikers), the elimination of some trails, inability to create new trails, loss of back country travel in our vehicles, more road closures without new roads to replace them, loss of ability to hike with a leashed dog – since the Feds believe dogs may chase wildlife even while on a leash – and we could even lose our choices of trail head and associated trails we’ve always known or the choice to go off-trail to do rock climbing. As it is now, we all have the right to enjoy our public lands, but traversing a Monument is considered only a “federally defined” privilege. Unwitting violators will be met by uniformed and armed federal parkland police! Great research effort on your part. Thank you. Please call or email Perey (James.Perey@yc.edu (928) 634-6513) and Wills (penny.wills@yc.edu (928) 776-2307) and demand that this Wednesday’s OLLI meeting be rescheduled until both sides can be heard. Arizona Liberty attempted to get on the OLLI calendar and has been told that there are no openings in the OLLI Sedona schedule until January 2016. Our tax dollars support Yavapai College and lobbying by KSB is a possible violation of IRS 510(c)3 non-profit tax-exempt rules. Tell the Perey and Wills that they owe the community, which opposes the national monument by almost 6 to 1, the opportunity to hear both sides! spent time talking to fellow libs today & guess what they can’t believe being ANTI MONUMENT isn’t a REPUBLICAN RIGHT WING position —–note to libs being against the monument is a LEFTIST POSITION ——- I”M A LIBERAL. GET IT YET & WE BROUGHT LOTS OF RIGHTIES TO OUR SIDE. GET ON THE RIGHT SHIP!!!! we square? get off the partisanship & recognize what’s real? Are you, per chance, trying to compete with Steve Segner to write the most posts with the most unintelligible sentences? You two certainly don’t speak well for the libs who can never win a debate in a public forum! Not a partisan issue! Rocks don’t care, people should. Do what is right for Sedona and the Verde Valley. How much simpler can life get than to decide this issue? Read the facts and don’t be swayed by popular opinion or special interest groups. Try and act better than your elected representatives! @arizonaliberty Don’t boycott and have everybody go who supports or is against it. The speakers don’t control the Q&A so bring visuals and handouts and pass out before and after and bring bumper stickers & tee shirts. It’s a free event supported by tax dollars. Free speech is protected. Isn’t this the mission of a college Yavapai College & OLLI? Am impressed with the information here and thank my college friend in Sedona for bringing it to my attention. In April, the town of Tusayan officially opposed the creation of the watershed’s designation as a national monument and recently passed resolution No. 2015-06 in support of U.S. Senate Bill 1416 that would prevent the president from changing the federal water-rights designation of lands declared to be national monuments. I sent an email to Yavapai a couple days ago and they have acquiesced. The opposition now has a program on Oct 12th, 12 to 2. Here is the follow up email I received today. “Thank you for contacting the college. When the OLLI “lunch and learn” session was booked over four months ago, we were unaware of the strong divergent perspectives on this critical issue to Sedona. In order to provide a full examination of the issues we have scheduled an additional session, with folks that share your concerns, at the YC Sedona Center on Monday Oct. 12th from 1-2:30 P.M. Having the session in two weeks allows time for us to get the word out to our OLLI participants. OLLI’s goal with its “lunch and learn” program is to share a variety of non-partisan information with the community. Susan, appreciate the notice because I called too & seems several had and this website was mentioned. They get OLLI notices & lots of people go because they do but still think people out to be there & offer info to those that go tonight & can’t make it back. Good civics lessons. I’ve been browsing more information sources and not only what KSB & Tom suggested. I’m disappointed in KSB, I’m disappointed in city chamber and council, I’m disappointed in Tom. They’ve all gone rogue making decisions without learning both sides. Fools rush in. Redeem yourselves by voting against supporting this monument thing. Big Park Council too. 200 KSB members are making a decision for THOUSANDS OF US & THOUSANDS OF US ARE AGAINST THIS? I’m mad as hell!!!! Red Rock news polls say 86% OPPOSE THE NATIONAL MONUMENT & MORE EVERY DAY ARE AGAINST IT. Don’t be coming to my restaurant KSB with your stupid petitions, I’m ticked off. I hike these trails & climb these hills every day. They’re beautiful & we work hard to maintain them. HANDS OFF MY SEDONA !!!!! Yeah, Kevin. Totally in agreement. You have to wonder who died and made Tom OHalloran king of KSB. Then he knighted his minions, and like the good little money grubbing entrepreneurs they are, galloped off wildly chasing windmills and nonexistent dragons. All the sheeple hear is “we’ve GOT to PROTECT the RED ROCKS from DEVELOPERS – I have mine and now there’s no room and no business and definitely NO money for the flatlanders! Yehaw and Ahoy! Headlong into the nastiest group in Washington we’ve ever known. Where are the likes of Ike, of Kennedy(s), Reagan (when he wasn’t suffering from Alzheimer’s), Governor Brown(s) (before Moonbeam turned communist)? Where are our heroes? Oh right, in line at the clinic because the Feds won’t allow 9/11 first responders paid medical expenses for their acts of bravery. How does that relate to Sedona? This THIS is who will be the primary governor of Sedona and the Verde Valley. This is due to a few (nameless and anonymous) KSB members who “at the direction” of one person looking to further his senatorial aspirations, decided to turn all of Sedona and the Verde Valley over to unknown bureacrats who use our National Monuments and Natural Parks as pawns in politics – do you NOT remember how they treated the WW2 veterans who had come to Washington to celebrate their victories of freedom? Wake up! Really. I just can’t understand how people can not see what is happening to our country. Ptutin has given notice. I hear chatter about FEMA camps being set up as burn centers, emergency supplies gathered. Have you NOT seen the white helicopters flying by? WHITE with BLUE STRIPES. That’s either FEMA or it’s the UN. Both lousy choices considering the mood of the country, Biblical prophecies aside. We HAVE got to DO something, even if it begins with just going outside for walk and enjoying everything we have. Now imagine that same walk with paved walkways for handicap access, no vehicles including mountain bikes, no dogs, railed, curbed – no stopping, no going off trail AT ALL, and imagine now that you can decide between the two. You have to imagine it, because YOU DON’t HAVE A SAY. But imagine you could choose. Which do you prefer? The way things stand – and BTW @ USFS, if you needed help, why don’t you just say so? There are 100’s of volunteers who dearly love their home and would be perfect stewards of the land since, as I mentioned before, we LIVE HERE. So now imagine you had a choice – more traffic, with the added bonus that last Labor Day will be an everyday thing. OR We muddle on somehow, taking care of things right here at home. Things stay pretty much the same, we’ll be cleaner and neater out on the trails and we’ll continue to look for solutions to the traffic problem (be sure to check out Eddie Maddock Eye on Sedona Traffic). Never believe that YOU can’t make a difference. If each of us, beginning with Obama and Putin said, “May there be peace on EARTH and let it begin with ME,” billions of folks would follow suit, but alas, that is only a pipe dream. What ISN’t a dream, and IS within our grasps is to tell KSB to stop this madness. They’d do it if we all asked; they’d do it if they really loved Sedona and wanted to keep her beautiful. The take-away from this mess just could be that we can come together and figure things out without the help of the Federal Government. from here it appears America not given free choices and that is interesting. it seems opposite of the country rights? good morning to many. TOTAL DISASTER! This is what could be the fate of the Verde Valley and Sedona once a National Monument Proclamation is issued. This is a letter to the editor of The Independent, a St. George, Utah newspaper. It’s about Zion Canyon, and it includes every concern you should have regarding the fate of Sedona if it is designated a National Monument. The NM designation does NOT come with any federal money to cover the increased tourism. Total disaster! Utah Travel Council, Staff, Board, Utah State Legislature, Utah Governor Gary Herbert and Washington County Commissioners, Washington County Visitors Bureau. I live in Springdale, Utah the gateway community to Zion National Park. I have lived and worked here for 15 years. The population of Springdale is about 548 people and neighboring Rockville is 250…including elderly, youth and children. A cordial population that you and 3.6 million visitors take for granted. We are the greeting staff to USA and international travelers. The reported triumph on the state media services of the 30% rise in visitation to Zion National Park ignores the Back-Story of what is truly going on here. We have become an ant hill. 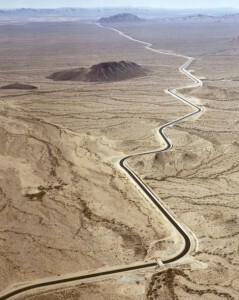 This is a narrow canyon with a two lane road. There is only one way in and one way out. In your meetings have you ever discussed the costs of such impactful visitation numbers beyond the cha-ching of coins in business, county and state coffers? Have you discussed the costs on the backs of local residents, service workers and National Park employees as well as conservation of Zion, a National Treasure? Allow me to tell you some of those costs. You might say we are bringing jobs. No, you are bringing tourism and unsustainable consumerism to a fragile ecosystem. The medium income in Washington County, Utah is about $21,000 a year….unlike the larger Park City of Wasatch County which is about $80,000 over all income. The jobs here are minimum wage jobs and the most workers do not live here but in Hurricane or St. George. Yes, this is a business friendly state, but not a worker friendly state. Every time the legislature makes a TRT Room tax hike for the tourists (now over 12%) the bulk of this money is divided through the state to maintain travel council and visitor bureau salaries and business endeavors. Well and good, but not enough shows up in Springdale. Yes, the pressure of extreme tourism to our canyon environment and the infrastructure of small town Springdale is costly. We need funds here for improved infrastructure, NOT more advertising or international promotion or junkets for travel council employees. It seems visitor bureau grants are only given out for advertising an event, not paying anyone. It is difficult to walk or even drive across SR 9 when there is a two mile road back-up to the entrance gate to Zion. Again, there is just a one two lane road here. We need stop signs…crosswalks, more sidewalks and bike lanes…but not more parking lots. The RV traffic is perilous because the town, the tunnels, the park cannot accommodate it…though the Park has been expanding their Visitors Center lots…it is not the solution. In March on just one Saturday we had 2400 hundred run the half marathon from Virgin to the Park Entrance (they were running and not driving). The fee to the runners was $95.00. Times $95 by 2600. After permits…Rockville received from the Vacation Races Company, just $1000 as thanks to the local volunteers. Thanks folks, cha-ching, cha-ching, cha-ching!!! Where do the man power and monies come from to support these tourist entertaining events? Not from the promoters or state legislature and travel council, but from the local tax paying land owners, stretched small town coffers, local volunteer residents and local business owners. Who puts on the not-profit Earth-Day, music festivals, Fourth of July & St. Patrick Day Parade or Z-Art events? The goodwill of Rotary & Lions Club fundraisers, the state Humanities Council, local business owners and unpaid volunteers. We now have three franchise hotels in Springdale, La Quinta, Hampton Inn and Holiday Inn Express…unfortunately; their community involvement ends with the corporate responsibility to their investors. This year, due to national politics, the Zion National Park (The Golden Goose) is understaffed and a dollar short because their budget funding comes from the Federal Government and those wheels move slowly. Not to mention the supposed Class 1 air quality the National Park is supposed to strive to maintain; all those added parking lots encourage greater passenger car traffic and the air keeps getting hazier and more polluted with ozone and PM 2.5 from increased off- road vehicle traffic. Recently, because of the ad blitzes, the Zion Park employees (guardians of the natural world …some of who are volunteers) are stretched to exhaustion on a daily basis. Those who work on the East side of the park may end up adding one and half hours to their work drive time because of the daily tunnel traffic. It has become Disneyland without the rides and efficient crowd & car control. The National Park does its best with its limited funding. Again, it is a monumental effort just to keep all the visitors on the designated trails. The Narrows Hikes (get a hepatitis shot before you go) and the more dangerous Angels Landing hikes are becoming as busy as Madison Avenue at rush hour. Think trash and river sewage, it is our new reality in the canyon! Many local citizens and park employees would like to request that you stop your ad blitzes which must cost thousands, if not millions. Please, please direct some of that money toward funding the necessary and oft time deficient PTI shuttle system. This system is so necessary, but totally overwhelmed. It is short of buses and drivers. The present drivers have been driving 10 to 11 hours with few breaks and forced to make unsafe maneuvers. Outside town parking was figured out in Telluride Colorado years ago. Perhaps, the town shuttle could be extended to a parking lot west of Rockville to relieve the traffic on SR9 and in Springdale proper. What about our Paramedic and Fire Protection services which basically give free assistance to the tourists any day at any time? Up until last year, Rockville/Springdale Fire Protection was volunteer. This year out of desperation and fairness to the volunteers…our Fire Protection tax was doubled to provide for wages and equipment that will meet state codes. We are fortunate to have excellent medical staff in our one room trailer clinic. But because the clinic runs on a shoe string (It isn’t profitable enough for a Health Corp. to keep it going.) The medical staff must work part time in Salt Lake and St. George in order to keep the clinic open during tourist season. Again, could the legislature pass funding for our town’s antiquated sewer system which backs up in hotel rooms and private residences? How many toilet flushes and showers of 3.6 million tourists can the Virgin River accommodate? Springdale has 3 full time overwhelmed maintenance workers. We need a full time maintenance worker just to put out recycle bins, pick up the daily trash and empty sand cigarette holders at shuttle stops. Not everyone coming to the canyon respects nature, but again resident volunteers pick up trash in our parks and in the river for the very reason they chose to live here….a respect and love of the uncontaminated natural world. Do any of you work for free? Our Town Planning Commission and Town Council do. And would you work for free to assist 3.6 million visitors to your home yearly. Would you even work cleaning hotel rooms here? There is always a shortage of housekeeping staff. How about working as a park employee full-time with a part time seasonal status with no health care or retirement benefits. Or perhaps being a restaurant server at $2.50 an hour where your income is chicken today and feathers tomorrow. Remember, there is a fine line between being a business friendly state and exploitation. Maybe it is time to raise the minimum wage in Utah. I hear the legislature is thinking of raising the governor’s salary. I moved here in 1998. My property taxes were $700 and now in 2015 my Washington County taxes are up to $1800….and probably climbing. It seems Zion is the goose that lays the golden egg for many. But the geese are leaving from the onslaught which is taking its toll on park wildlife…fewer birds, fewer foxes, fewer everything but more helicopter noise from daily air tours. Can we love Zion too much? Where is the ecological sustainability plan? Yes, unwittingly your promotions are causing us to pave paradise and put in a parking lot….lots of lots. You hit the nail on the head. 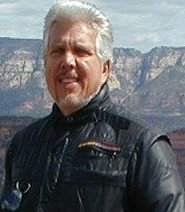 @J.J. Sedona City Council are the one with that agenda with the special interest groups lodging and chamber. That is why they funnel 1.5 million to their regional club, disrespecting the entire incorporated city. They set a precedence when they voted to take taxpayers money and “gift” them millions of dollars without the businesses that collect those taxes a voice. Since no one spoke up on this issue the SCC felt no one cared and that everyone was asleep at the wheel. They been paying for regional things forever. The region took the money now they OWN you. They want the Flatlanders to shut up. The SCC, Lodging, Chamber don’t feel you or anyone else matters. It is very apparent in their actions. Thanks for your posts J.J. Delightful to see. If the people don’t speak up on ALL these issue it enables SCC to do whatever. They have proved that they WILL wait until they debilitate you, or slip it through when you don’t expect it. It is time for a watchdog group to control the outlandish arrogant SCC. And Yes read Eddie Maddock articles as there is alot a SCC rubbish uncovered by her. Ms. Maddock has been reporting this for years. Some of us even got to see the program “Backfire” years ago. John Hellman & Eddie Maddock uncovered a great deal. What a GREAT information show! Time for a watchdog group to protect the “region”, our childern and “flatlanders”. @J.Rick you are serving the community with your great articles. Keep it up. I look forward to everything you write! Why do people who think and write great articles piss people off? Tell them to *()^ off and keep up the fine flow of information. Thought this article we are responding to was about the KSB proposed National Monument instead of old history? For the moment, could some of us get over the regional chamber and the idiotic stances our council has taken to throw our moneys out the window and stay with the major issue of the National Monument? Lets stay on track – Please! @I See Through You – Thanks very much for your information. keep trying to help us. @Truth Be Told, bringing up the SCC and chamber has EVERYTHING to do with the National Monument – if you would stop and think about it for one minute, you too can connect the dots. @Yunis DeVries – hello to you too! Yes! this National Monument goes against everything it means to live in a Republic because it’s takes away a democratic vote. We don’t like the direction this is taking, which is why it’s such a hot item. The few people putting this proposal together have NO RIGHT to self-proclaim themselves as the voice of 80,000 and Tom O’Halleran has NO RIGHT to use Sedona as his spring board into the US Senate. 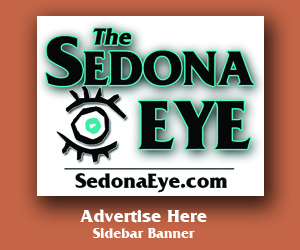 Wrong direction KSB Keep Sedona Beautiful – Boycott their website because it counts eAch visit as a POSItive !!!! NO NO NO from this Ridge homeowner !!!! You are doing sedona wrong !!! Just went on the KSB website regarding the National Monument..
Visit http://www.arizonaliberty.us to understand what KSB is NOT telling you about NM. obviously you have not read any of the comments here. You like THE IDEA of it. Yes, a fine idea. Not only a fine idea, but a regular first class fairy tale. KSB can’t keep the promises they are making! The USFS is 11.7 BILLION dollars in arrears and there’s been 19 other National Monuments competing for the same (non-existent) grants. There is one source of money called the Land and Water Conservation Fund (LWCF) that gets it’s money from off-shore petroleum fees and taxes. KSB is under the delusion that this fund will take care of the Red Rocks. Yes. It will. But in nefarious ways – the USFS will use this money to purchase private property – particularly if the property has a good view and water rights. Go read the KSB website again. Everything they say, actually the opposite is true. I thank you both for your great contributions to the debate over this issue. Please go to the next article, entitled “The Colossal National Monument Deception!,” and continue to post comments there. MONDAY: OLLI Lunch and Learn. 12 – 1PM bring your lunch. Presentation from 1 to 2 PM at Yavapai College Sedona Center. Follow up response to the KSB – Monument Coalition program in September. Titled: In-Depth Look at a National Monument Designation – An Overview, Concerns and Issues, 30 minute presentation and 30 minutes for Questions and Answers. TUESDAY: SEDONA CITY COUNCIL MEETING: We need to have as many people as possible to be at this meeting to show opposition to the National Monument as there will be no opportunity to speak. But that won’t stop us. We can still submit card to speak at the council and if they get enough they will have to listen! Be at the City Council meeting at 3:30 to join the fun! b. AB 1961 Discussion/possible action on a resolution in support of creating a National Monument in and around Sedona. This will involve City Council discussion and deliberation only. No outside presentations or public comment will be taken on this item. WEDNESDAY: Cornville Town Hall – In-Depth Look at a National Monument Designation. THURSDAY: Village of Oak Creek Town Hall Meetings: In-Depth Look at a National monument Designation. ~ Big Park Coordinating Council voted to RESCIND their letter of support for the National Monument at their October 8th meeting. Vote count was 16 to rescind the letter of support and 6 to endorse the NM. Hat’s off to President Steve Nelson, and the council for running one of the best meetings in this effort!